Metered street parking is available on Little Lonsdale Street, King Street and La Trobe St.
Trams 30, 35 & 86 to Spencer St/La Trobe St (202 m). Train station: Flagstaff or Southern Cross. The restaurant can hold up to 140 people sit down lunch/dinner or 250 people for stand-up cocktail event. 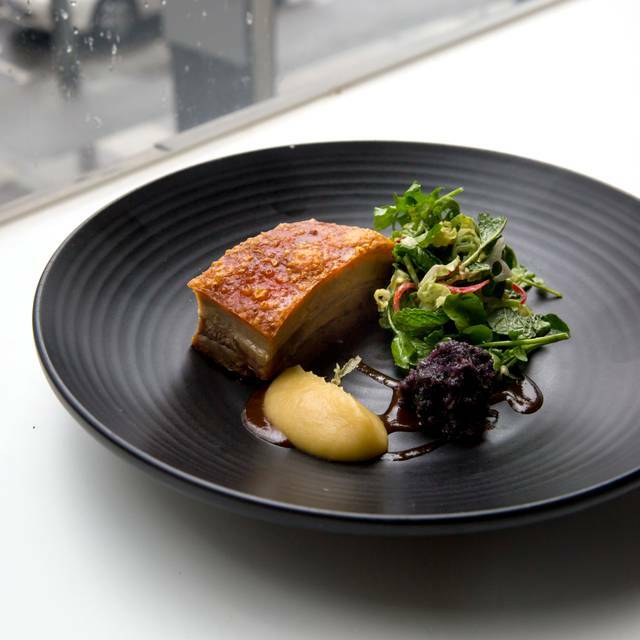 Rated as one of Melbourne’s best value dining experiences, we invite you to share in a truly unique dining experience at our award winning training venue the Angliss Restaurant. 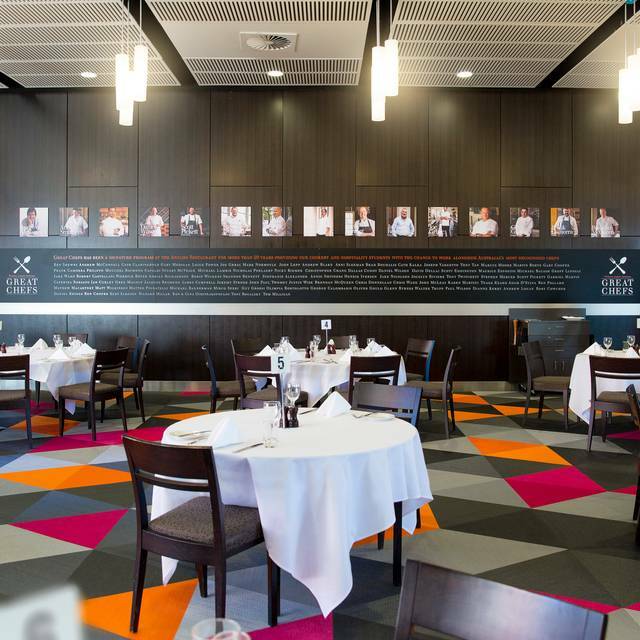 Angliss Restaurant is the Institute's flagship venue and the home of the Great Chefs program. The Angliss Restaurant provides a professional-standard training environment for our students and an affordable dining experience for guests. 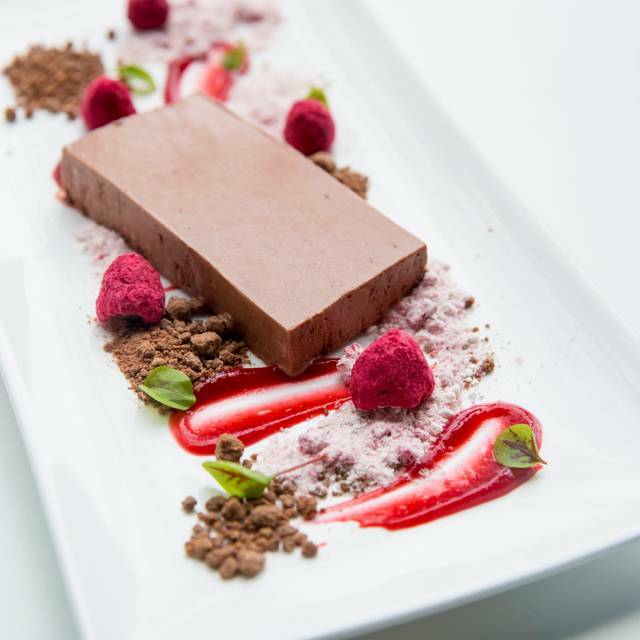 The food style offered at Angliss is a fusion of contemporary and classical influences. 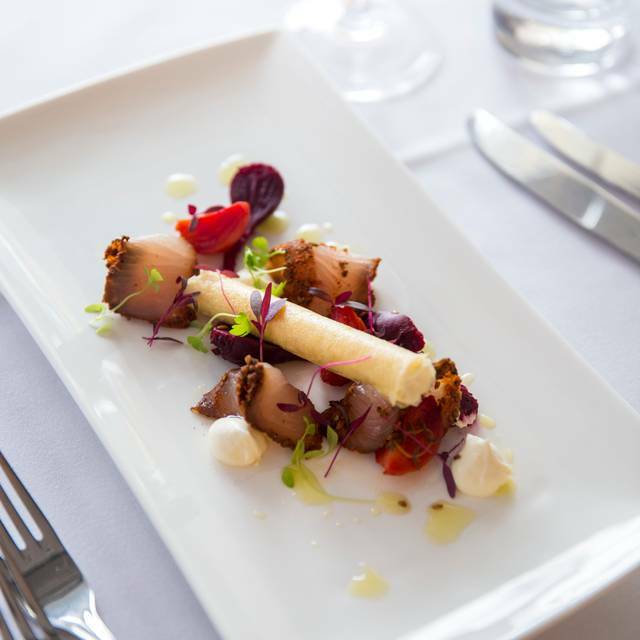 Guests will enjoy culinary delights from final year apprentice chefs and cookery students and impeccable fine dining service provided by hospitality students. Lavish three course buffet lunches and dinners are also available throughout the year. These offer excellent value, with choices including soup, salads, hot dishes, roast carvery and a selection of desserts. Variety of menus options and reasonable prices for drinks. I always enjoy coming to Open Table. The students make me feel very welcome and well the food is just superb. This is five star cooking without the pretence. And that is why I love it here so much. I'll keep coming! Great watching young people learn they look very professional in their uniform. The teacher is full of support and knowledge and encourages the students,. Great positive happy vibe amongst the young adults as hey are willing to learn. More confident and have learnt a lot since the last tim I attended dinner. Great experience before actually going into the work force? This was the second time that we had dined at Angliss Restaurant, so it was hard not to compare the two experiences. We had a traditional 3-course Christmas luncheon, which was exceptional value. The tables were beautifully decorated - white linen, crackers and Christmas themed table displays. Unfortunately there were no options with the luncheon, so whilst salmon gravlax might excite many as an entrée (and is a luxury dish), two of our dining companions did not enjoy. It is a training facility, however it was hard to see how the waiting staff were given guidance, unlike the first time we dined at Angliss Restaurant. And our waiter did require some guidance! We were disappointed that cocktails were not on offer and the "stewed" coffee and tea at the completion of luncheon was reminiscent of many budget/high volume "cafes". Minor criticisms aside, we had a delightful, great value luncheon. Was a fabulous dinner with wonderful service. Overall it was a lovely experience. There were a enough GF meals but only 1 vegetarian dish. Appreciate the effort of all the staff, cooks etc. It's a wonderful way to gain experience for those training in these areas. We had a fabulous time - don't know why we waited so long to experience this Melbourne gem! Angliss Restaurant is a great dining experience, staff are polite, food are tasty. Please note that as it is a training restaurant, we need to allow enough time (approximately 1 hour) for the 3 course meal to come out and to finish the meal in the relaxing atmosphere. Fantastic place which will shape the chefs and staff of the future. Wonderful food, great service set in a really nice training restaurant with great atmosphere and attentive staff. The maitre/lecturer, Tim, was very friendly and professional. However, it does not seem that the staff/learners have learnt their trade (setting cutlery correctly, serving/collecting plates from the correct side, giving the correct plate to the right person) as we were told they hadn’t had much practice. Their English language skills are also lacking and they misunderstood our drinks order, probably due to nervousness. The menu was interesting although for someone who eats neither pork nor hot spicy food and prefers to eat meat rather than vegetarian, there were no options for a main meal. The food itself wasn’t bad. The desserts were had too many ingredients and did not reflect what eas advertised - a ‘creme brullet’ is a ‘creme brullet’, not a bit of pie with hard crust; the panacotta was also something else. I would go back and give it another go and I suggest giving these kids more rehearsal time. Great food, (delicious seafood) great value, quiet ambience and friendly service. This was my first visit to the Angliss. we were really excited to attend and really enjoyed my meal and the ambience. The wait staff included a student from our school, so we were very intent on supporting her studies and those of other students - all of whom were clearly very engaged in what they were doing. I thought the staff were friendly and obliging (although quite nervous) adn really did their best to attend to us. The prices very reasonable and the food delicious. My main meal (beef cheek) could have had a little more in the way of veges, but no mind. One of our party is vegan, and was resigned to just seeing what she would be served. She was pleasantly surprised by her food and really enjoyed it all. We had a table of 6 and had a very sociable time, being able to hear each other and although we were very chatty, I don't think we disturbed other tables as there was plenty of room between the tables. Thank you for making this visit so enjoyable - we will be back. We dined on a "Buffet" night. I expected it to be a learning/training environment however this did not appear to be the case other than the chef barking at some of the trainee cooks when setting up. Our waiter was pleasant but I suspect was in the early stages of his course and his inexperience was obvious, e.g. clearing crockery & cutlery, glasses, serving drinks etc. The main course food was placed in roll-top chafing dishes approximately 10-15 mins before service commenced. The lids were left open resulting in the food not maintaining temperature. We had entrée first so when we got to mains they were depleted. We were told fish would be refilled shortly. It was - goujons with onion rings. I went up shortly after they were presented and both the fish and the onion rings were cool and closer to cold than warm. If the food was the product of students, then perhaps understandable, however, in a "school" environment, I would have expected the students to be receiving guidance from teachers. Also I expected someone would ask me for feedback during the course of the night. As I said it is a great idea and we will be back. Buffet style. Favourite items were the potato salad, fresh bread and mini blueberry friands. Mains were a letdown and the least enjoyable part of the meal. Chefs at each station were lovely and friendly but our waitress had a bit of attitude. Went for the experience and would come back again to see what else they have up their sleeve. The hospitality students were very good and their enthusiasm to present well and be efficient at their role was evident. The supervising teacher was excellent in the manner with which she spoke with all the students under her charge; it impressed us enormously. She conveyed great care and kindness in the manner with which she helped them improve if they had misunderstood something or stated something incorrect. The food was very good, both entree and mains, except the main pasta version which as noticeably smaller than the other dishes. We will definitely consider returning for the atmosphere was quiet and easy to communicate with each other. Loved our night out at the William Angliss. We had a family get together. 2 tables and 17 of us. We were able to chat easily as it was not too noisy or crowded like most places. Background music perfect pitch, service excellent, food great. Highly recommend! Outstanding food, staff were nervous and seems to have a little knowledge of menu. But 5/5 would come back again. It was a lovely night with my husband and daughter. We did expected it to be a bit more busy but was very happy overall with the night. Thank you. Who on earth came up with that list of options for an indoor City restaurant? The only problem, as always, was that I ate far too much! Heh. Always so many delicious things to choose. I'll be back again. and again, and again. Trainee chefs produced a fabulous dinner, enjoyed every mouthful. The trainee wait/beveridge staff also did a terrific job, very attentive. This was our first time at the restaurant, will definately be back. Wasn't open. Open table thought it was open and when we went there it was closed. What a talented group of young people, may they all do well in their chosen field of work. Had the buffet dinner which had plenty of variety and interest. Quite a few couples dining, and one group. We booked for 6:30 pm, but had to wait until after 7pm before being seated. Enjoyed tasting all the different foods, and delicious desserts. Pleasant ambience. Would like to try the a la carte menu next time. The dinner was prepared and served by students studying Higher Education qualifications at William Angliss. Unfortunately numbers of patrons was low which affected the ambiance. the quality of the food was very good although the menu is somewhat limited. Is this the best kept secret or am I late to the party? What a great lunch we had. Whilst well paced and not something to do in an hour, the service, attention to detail and food were to a high standard. We really couldn't fault the team and will be back very soon. The four of us really enjoyed our lunch. The restaurant is spacious and the service was warm and attentive but not intrusive. Our food was excellent, served promptly, and a request to alter a dish was accommodated happily. All the trainees did an amazing job, and this is a great way to support their careers. Highly recommend! The quality of the food was superb and the standard of both the kitchen and the waiting staff was outstanding. We have paid top dollar for food and dining experiences all over Australia, and were blown away by the high level of service that we received and the food quality and presentation, we will definitely recommend and return! Considering all the staff were trainees, many in year 12 of high school, it was an amazing experience! Thanks and praise to all the students and their teachers. Staff did very well despite some nerves. Great dining experience in which support is being provided to students within the hospitality industry. For a three course meal it is definitely great in terms of cost. Visiting the Angliss restaurant is a real treat - training chefs create delicious high-quality dishes and the training wait staff are attentive and strive to deliver great service. Visit to help people learn and receive a great meal (at a great price!) and friendly service in return. My partner and I have visited twice and we will definitely be back again! I required a vegetarian, dairy free, gluten free meal. The other guest had no dietary requirements. We all loved the food provided at every course. I was impressed that they could make my dish look similar while still capturing the fantastic tastes that the others experienced. I was also impressed that they brought out gluten free bread without me having to request it ... my only reccommendation is to also provide something like olive oil and balsamic as a substitute for butter. The wait staff were nervous as it was their first night of service and they still have a bit to learn but it was really enjoyable watching them learn. I look forward to coming back to see how they have grown. Food was lovely and so reasonably priced.